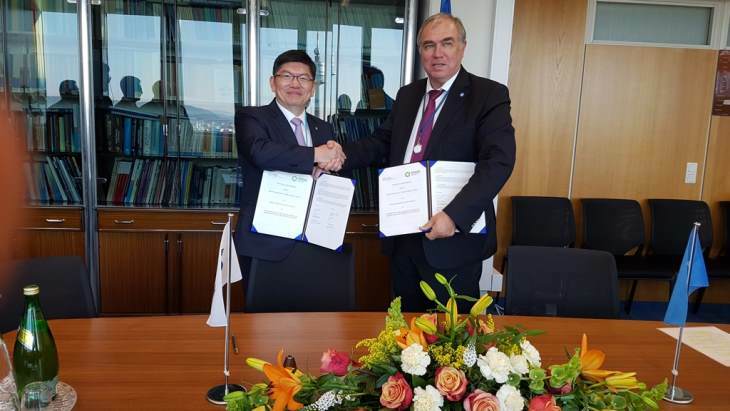 The Korea Radioactive Waste Agency (KORAD) has agreed to extend its existing cooperation and practical arrangements with the International Atomic Energy Agency (IAEA). The agreement and practical arrangements were signed by Cha Sung-soo, KORAD chairman, and Mikhail Chudakov, IAEA deputy director general and head of the agency's department of nuclear energy, on the sidelines of the IAEA's 62nd General Conference in Vienna. After originally signing a practical agreement with the IAEA in 2015, KORAD has expanded international exchanges by sending personnel to the IAEA to train specialists in radioactive waste management and international technology exchange, and to carry out projects related to the disposal of high-level waste. Chudakov said, "The safe management of high-level waste and ensuring the acceptance of the people are issues that the international community should consider together." "We will work closely with the international community to improve the safety management capabilities of IAEA Member States, including Korea, through the cooperation," said Cha. KORAD is a quasi-governmental organisation that was established in January 2009 as South Korea's national agency for radioactive waste management. It is responsible for the transportation, storage, treatment and disposal of waste, as well as site selection, construction, operation and post-closure management of the waste management facility. It comes under the Ministry of Trade, Industry and Energy.